Taking the whole family on safari can be a wonderful experience for parents and children alike! Setting off on a Travel Butlers family safari holiday is something really special that you'll all be buzzing about for years to come. After all, an African safari is a huge adventure for both little kids and big kids (commonly known as parents) alike. Catching the pure amazement on your childrens' faces as they encounter their very first elephant or giraffe is an incredible feeling - one that you'll wish you could bottle and keep forever. If you're planning a family safari, there are a few important things to keep in mind in order to ensure that every member of your family gets the most out of your trip. Safari lodges each have their own set of rules where children are concerned, so it's really crucial that you choose the right lodge for your clan. 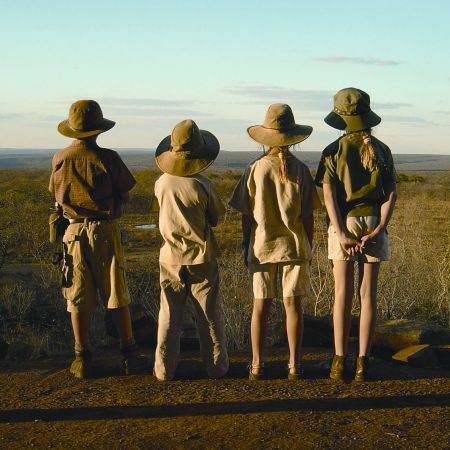 Whilst just about every safari lodge accepts older children, many do not cater for children under the age of 12, so this is definitely something to consider when you're initially browsing through your safari options. As a general rule, most lodges do not permit children under the age of 5 years to join long adult game drives. This is purely to protect the safety of your kids and ensure that everyone gets a top notch safari experience. Game drives require sustained quiet and patience, which are both big asks from an over-excited child in Africa! Noise and sudden movement can attract unwanted attention from the wildlife or scare it away altogether, so they are real safari-spoilers that can put all the participants at risk. As small children are so wonderfully unpredictable, it's just not a safe environment for them. Each lodge has it's own rules, so you should be sure to double-check exactly what these rules involve before booking your safari. After all, what could be more disappointing than finding out that your 8 year old cannot join you on game drives when you check in at the lodge?! Of course, we're here to help you find the best safari option for your family and ensure that absolutely nothing of this sort happens to you. We've compiled a list of family-friendly lodges to set you off in the right direction. Many of these lodges offer brilliant chilldren's activity programmmes for any kids too young for adult game drives, featuring a whole host of fun-filled activities from ‘bush bumbles' and themed picnics to insect walks and traditional storytelling. Other lodges will offer babysitting services to look after your little ones while you're out on safari. Alternatively, it may be possible for your family to hire a private vehicle and driver so that your whole brood can head out into the bush together on bespoke game drives according to the ages of your kids. This can be a useful way to get around any age restrictions, but please do bear in mind that it will involve additional costs. Finally, if you're planning a family trip to East Africa, using a private driver-guide could be the perfect solution. Not only does this bring the overall cost of the safari down (as it is booked on a Full Board basis and avoids costly flights between safari destinations) but there are no age restrictions on game drives as these are all done with your private driver. Accommodation is in cottages or rondavels, with canvas walls and solid attached bathroom and shower. Each room is simply decorated with local fabrics and hand-made furniture of African hardwood.